Whether you are building a new office or staying put in your current location, everyone has to allow for the future when it comes to cabling. The constant evolution of workplace practices and expectations means you have to plan for power delivery, wireless mobility, distributed processing, and techniques to manage and optimize the facility. The work you do now is critical to enable your business to thrive. 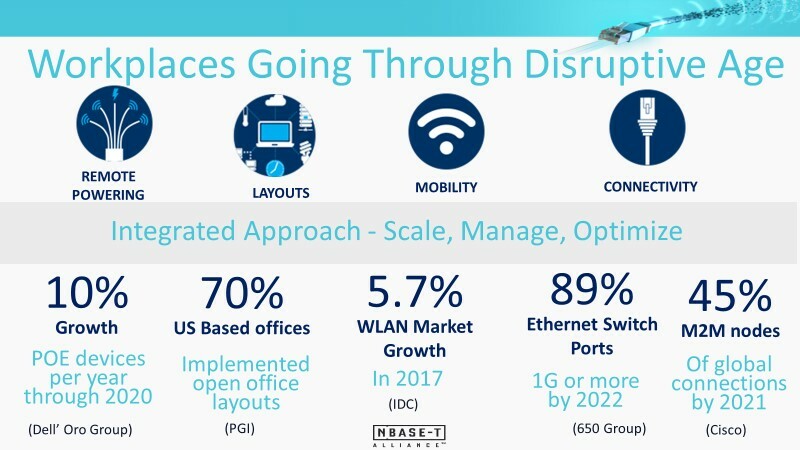 In a recent webinar, The Future Ready Design with NBASE-T Technology, Peter Jones and I discuss how today’s workplace technology is evolving at a rapid pace, and the set of trends impacting corporate LAN design. For your current buildings, we talk about ways to help the network support new business demands. For new installations, we talk through cabling standards and recommendations around NBASE-T and 4PPoE that provide the best long-term value to the business.